With a growing competitive business environment, one group is on the rise in Knox County to give small business owners the support they need in order to have a successful business. That group is the “Small Business Saturday” initiative, and they aim to make Knox County the best place to own and operate a business. Their most recent mission: make South Knoxville’s King Tut’s Grill the staple it's known to be. 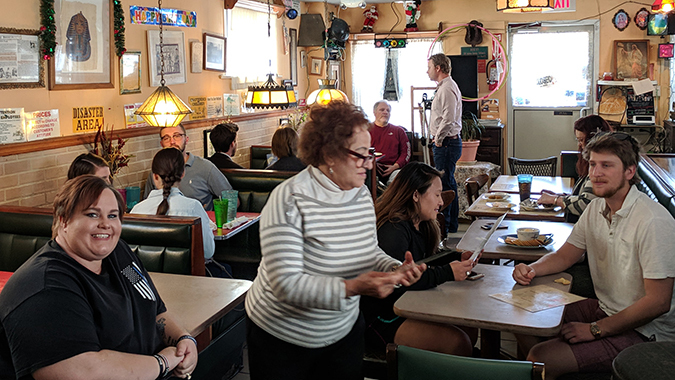 On Saturday, March 30, 2019, the Knox County “Small Business Saturday” initiative packed the South Knoxville staple with over 25 customers to support King Tut’s Grill. After 25 years of service to Knoxville residents, King Tut’s Grill faces a possible closure due to high EPA standards and a struggling business climate. “We had a packed house and we had every seat taken by someone who was there to support the South Knoxville community and the owner,” said Daniel Herrera, who founded the Knox County Small Business Saturday initiative. “This place has been serving the people of Knoxville for over 25 years and it is absolutely breathtaking to see the community come together and fight for a place that has done so much for Knoxville. The goal of this initiative is to bring a day-of-action to support small businesses who are struggling to make ends meet. The “Small Business Saturday” initiative is making a plea to the Knox County community and is calling on residents to support this business. “I am asking Knox County residents to support King Tut’s Grill. You will be blown away by the amazing quality food and the hospitality of the owner and staff. I am confident that you will be so impressed, you’ll find yourself going back again,” said Herrera. Visit the event's Facebook page at facebook.com/events/767225603654472/.